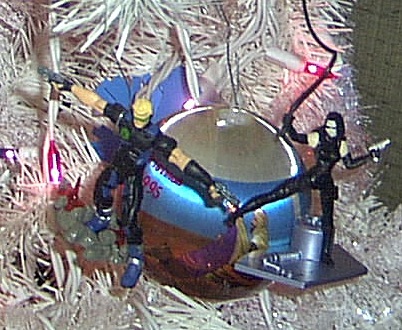 The tree-topper is the clear GI Joe that was last seen on part two of the RFC Halloween show. He’s got some lights inserted in his chest cavity. Here are two ornaments. The Astronaut with Space Capsule was made by American Greetings this year. The Scuba Diver with Sea Sled was a Hallmark ornament last year. 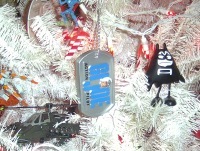 In this shot you can see the GI Joe Sigma Six Winged Fury Helicopter, a GI Joe Dog Tag ornament by Kurt Adler, and from the Aquabats, the Squishy Little Bat Pal. 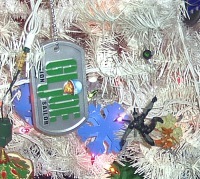 Here you can see another Kurt Adler Dog Tag, and a Sigma Six Snake Eyes. 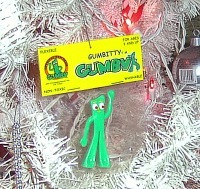 What, Gumby didn’t hang out with your GI Joes? Here you see the evil Baroness sneaking up behind Duke with her trusty bullwhip. 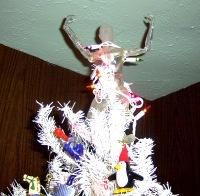 Never hurts to have a little S & M on your tree. In this last shot, you see Heavy Duty, the Vintage GI Joe Marine, and the 30th Anniversary Pilot. 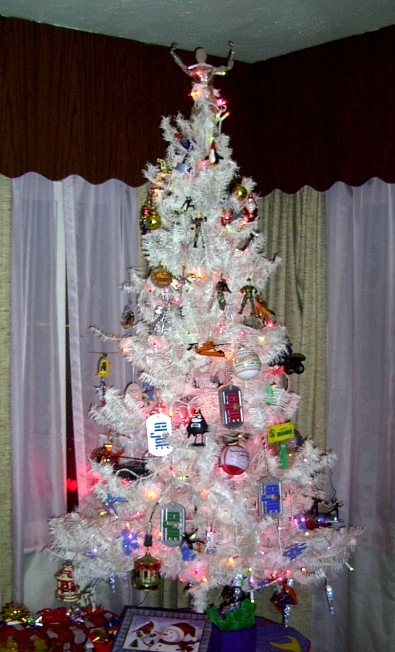 Not visible in the detail shots are Scarlett, Destro, Cobra Commander, the Adventure Team Helicopter, and more Battle Android Troopers than have ever been hung on a Christmas tree. Enjoy, and Merry Christmas everybody. I had those when I was a kid. Cobra Commander rules the world!